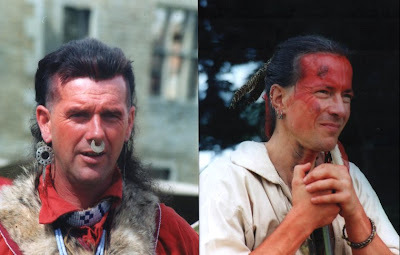 Excellent film of the Czech French and Indian war scene. Recommended. Here's something great - a diorama of Bunker Hill in 1/1 ratio - excellent. From something that was intentionally funny to something unintentionally hilarious. This German tv depiction of this Frederick the Great battle is possibly the worst depiction of 18thc warfare I've ever seen. The hand to hand sections (about 2:20) will have you spraying your coffee over the screen if you are not careful. 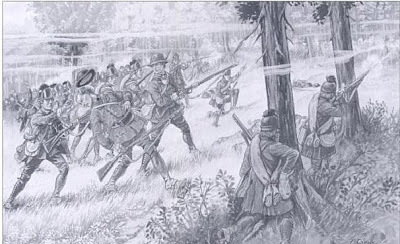 As far as I know this battle was fought in snow. 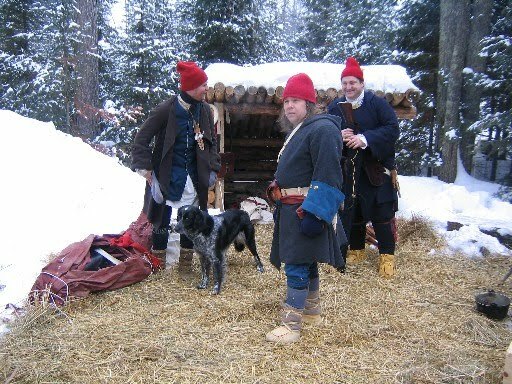 I have been enjoing the 'French in Wisconsin' site. It has some really well done pages and is a source for knitted tuques that look the bees knees. 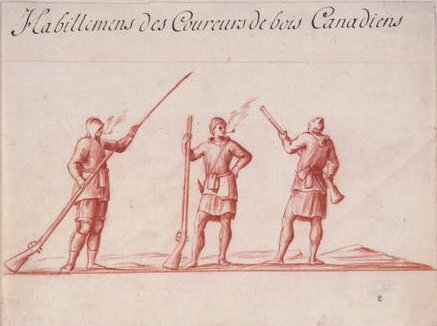 Check it all out if you have an interest in French and Canadian stuff for the Seven Years War and beyond. Researcch artle pdf on winter footwear is well worth a look and it has a great winter moccasin pattern. 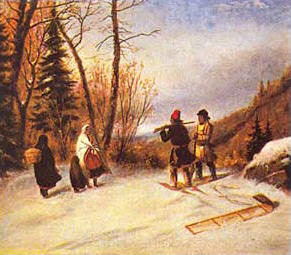 Another couple of Krieghoff paintings depicting Canadian life. 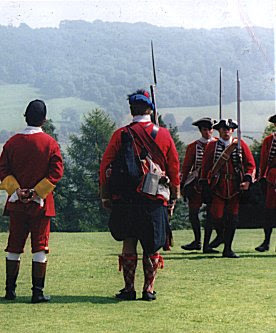 Is this fellow wearing a Scots bonnet in red? More images of Snowshoe art here where they have wooden snowshoes for sale. If you are interested in this Canadian classic this reconstruction is well worth a visit. Footwear for this time of year for Canadians and Natives are these boots. 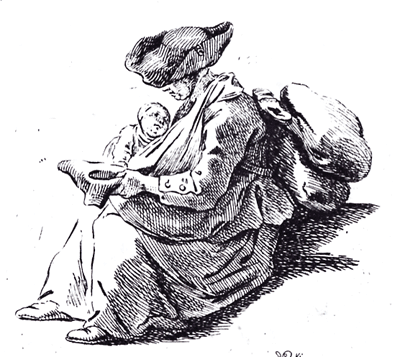 There are a number of 19thc examples in collections. I think we have had this 19thc image by Cornelius Krieghoff before but it suits the purpose of being my card to you and it shows the traine (sled) in some detail. Red tuque in evidence too. 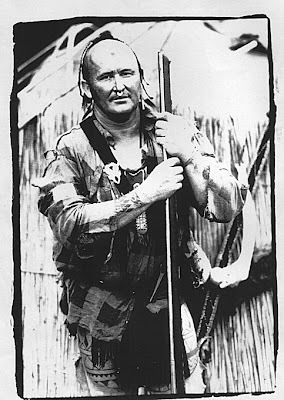 Canadians didnt change their styles much over the years did they? These are from the 1730s I think. By Francis Back this depicts a 1690 Marine but the clothing would be pretty much the same for 1750s. Some great images here from Black from His Majesties Independent Company of Foot from the Czech Republic of an event that took place last weekend. 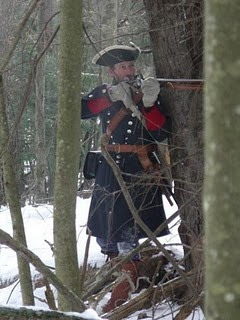 Looks bitterly cold but that's how we roll for the French and Indian war (says he in a nice warm house)...thanks for the images. Brilliant. 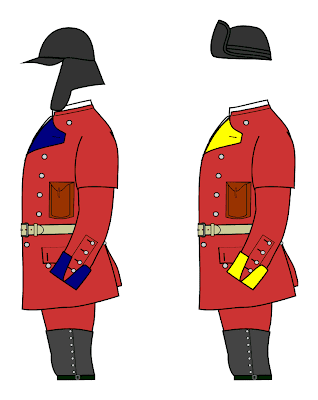 Image from the Royal Library Madrid showing the uniform as it was in the latter years of the SYW. After looking at the La Reine album I started looking at fusil M1728s - this would be a good gun for this impression. 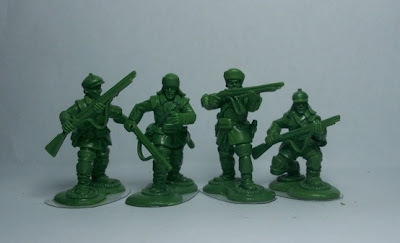 The 1/32 figures are here reviewed. The end of the video has individual close-ups. 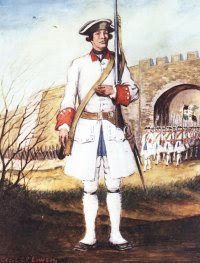 Someone who has made a life's work of studying the army of Louis XV is this man who has probably covered almost every regiment. 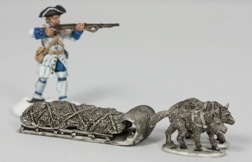 See the series 'Louis XV's army' on Osprey by Rene Chartrand. 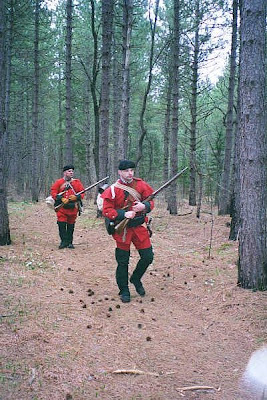 Paul Webb has a really good album of old photos of the Regiment de la Reine up on facebook. See them here and enjoy a fine group in its prime. I'm the guy on the right in this photo from about 98. 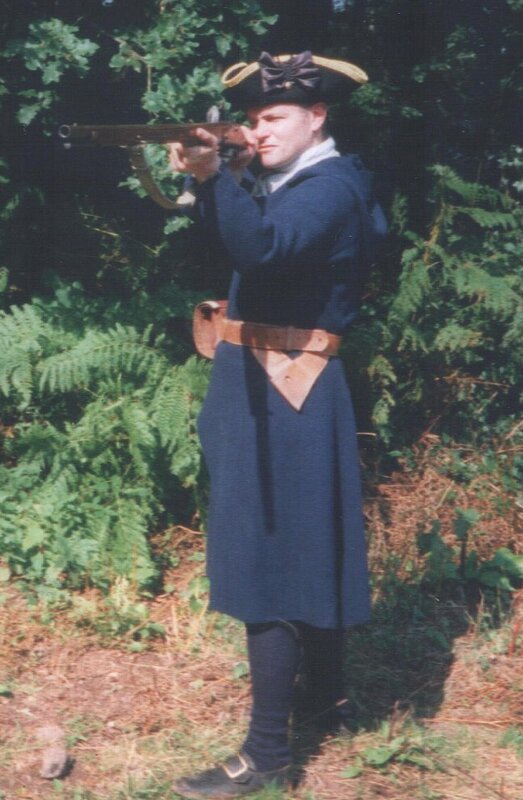 Been a while since I posted a picture of me - here's one of me when I was an 'officer' in the Compagnies franches de la Marine from about 1998 at a training event in Wales. 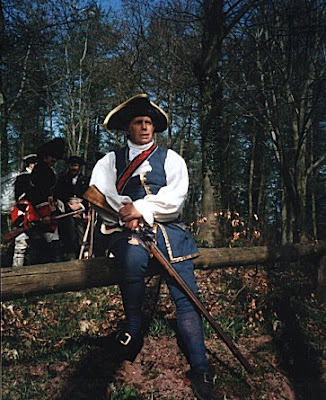 I am not sure what this is from - it's in French - looks like a miniseries - maybe one of our French or Canadian readers might recognise it? 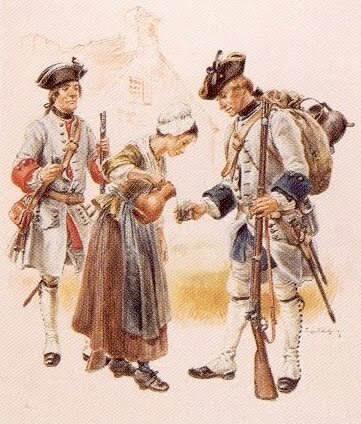 French language video on the Seven Years War. Part 12 here. There is some intriguing black and white footage in it which is quite epic which looks like its from the 20s or sometime around then - the silent era... anyone recognise it? Worth watching these docs even if you don't speak French. NB This is probably the 1914 film Wolfe or the Conquest of Quebec. There's quite a bit new on the GM site including studio greens and forthcoming plans for a Robert Rogers personality figure. It's quite a useful research tool to look at the sort of stuff issued to New France Militia when going on expeditions. Some of these items are talked about on this page. It's a great page with most of the period references for Milice transcribed. Recreating the light company and dressed according to Knox's description this reenactment group looks worth joining if you are in the midwest of the US. Wiki here. Interesting biography of the pioneer of Light Infantry here. 55th foot F&I service here. Bill on the Mocassins Group found this version of the De Levis papers. If you can speak French then you can read this important resource on the campaigns in the SYW online. Interesting look at a living history event and the participants. 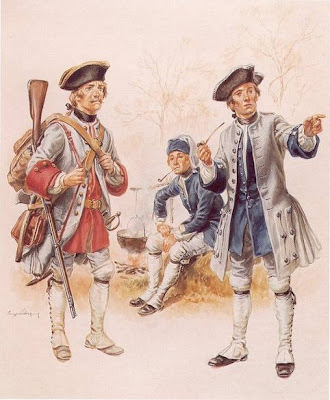 Apparently next October's Lake George tactical is going to be an important one so in order to promote this event a little read this account from a native reenactor. I would recommend this event to anyone especially someone from Europe as you get a totally different view of the geography and so on of the area around Lake George. A few posts on the theme of winter warfare, which was an important facet of the SYW in America. 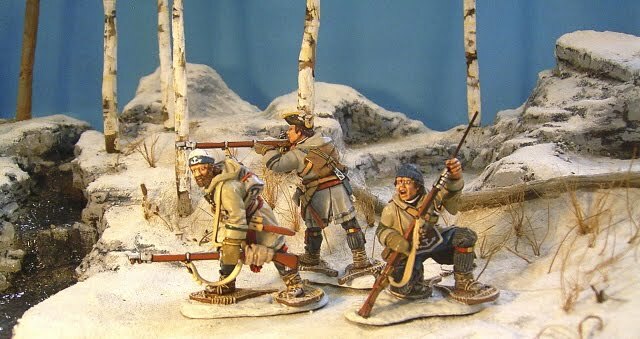 Wintertime saw a new set of rules for mobile warfare. 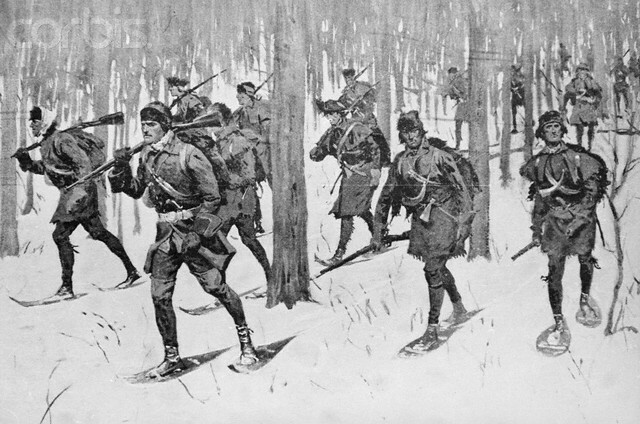 For the small numbers involved, incidents like the Battle on Snowshoes have captured the imagination of generations. 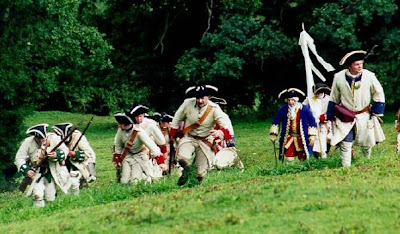 This photo is one I don't know who took it, but it's from the Snowshoes battle reenactment that takes place each March around Ticonderoga but it's such a good photo it needs a larger audience. 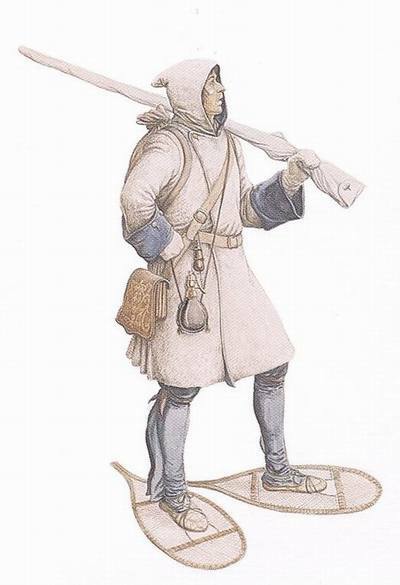 Incidentally this reconstruction is wrong in the sense that they had a linen strap for their cartridge box - but there ya go. An interesting and unfortunate unit the First New Jersey Regiment. In some of the worst military disasters of the SYW. 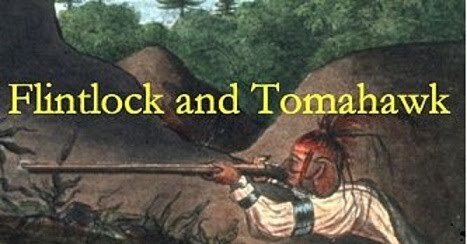 Formed in 1673 to ''repel foreign Indians who come down from upper Pennsylvania and western New York (in the summer) to our shores and fill (themselves) with fishes and clams and on the way back make a general nuisance of themselves by burning hay stacks, corn fodder and even barns." 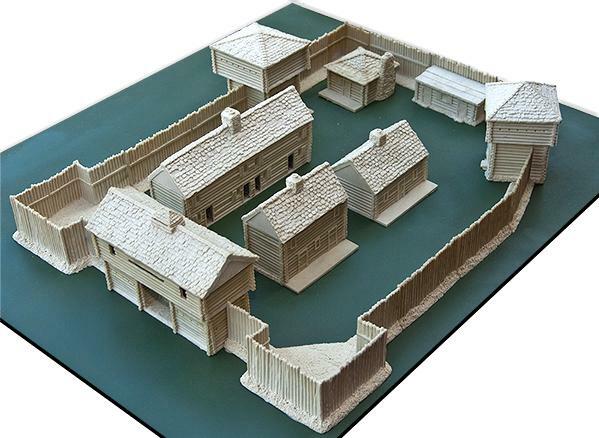 If you are looking for 15mm stuff this page of Blue Moon's 15mm line has some interesting product - including this resin fort. 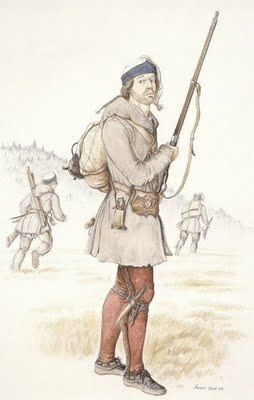 Somewhat less famous than Robert Rogers is this man who was one of New France's most successful scouts. 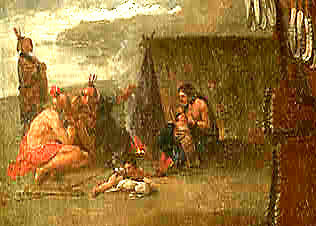 Referred to by Rogers as 'Longee'. His rank was ensign and he led many warparties around the Lake George area. Sadly drowned in a canoe accident during the defence of Montreal. Image is by Francis Back of Compagnies Franches de la Marine in campaign kit. 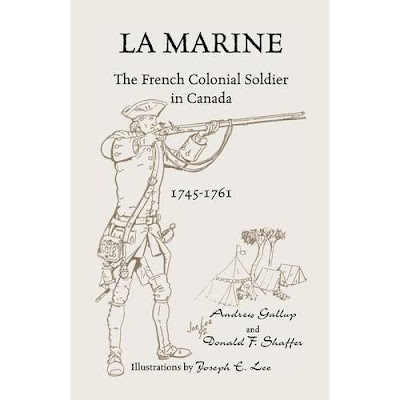 One of my favourite books on the Seven Years War is this book by Gallup and Shaffer. It's written by reenactors and it concentrates on what the Yanks call 'material culture' - in other words the items used by the Compagnies franches de la Marine. There's an interesting piece in French and English on their blog about future plans - seems like the English version of this game is slated for January/February - and they also give this blog a plug - thanks! This recent book is up in substantial chunks on Google books if you want to read about Ranging Rules and so forth. What I've read seems well written and researched. 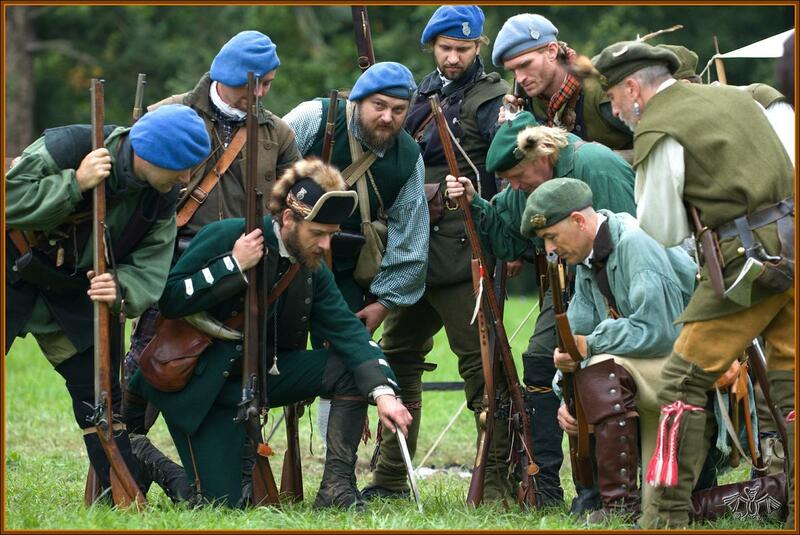 The author has his own Ranger group which has a fine website so check them out too. I like this blog - a very useful piece of work that encourages the reader to have a go - and there's quite a few North American types to look at. 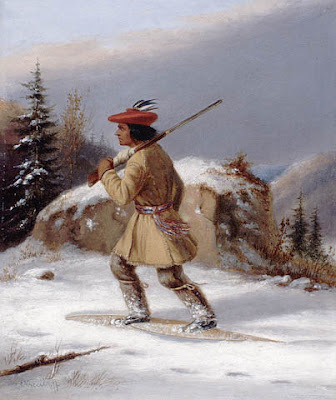 From a suggestion from a reader I thought I would post about Snowshoemen who were according to this section of the book 'The First Way of War' were the first type of Rangers - assembled ready to respond to incursions from Abenaki and the like when war erupted. Worth reading the section and you can read about the young Robert Rogers joining one of these 50-man companies which in their early life were primarily defensive in nature. 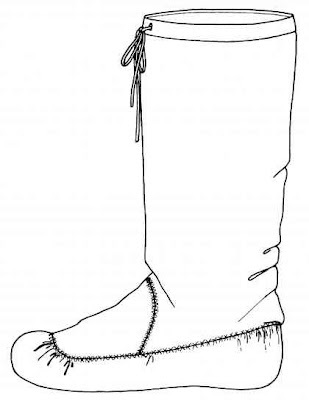 See also this page on reenactor's Harmon's Snowshoemen. The page is being revised at the moment but worth a look when finished. Film about the man and his work. Film about the famous Eastern frontier artist. Woodland Indians used bows - to not use them is historically wrong and misleading. 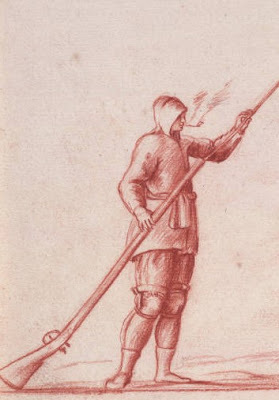 There is plenty of precedent for the safe use of bows in reenacting in the Dark Ages and Middle Ages - why not the SYW? Rubber tipped and backward flighted arrows are standard and there doesn't seem any harm done. It's dangerous and would result in problems. I'd be interested in what people thought about this subject. Had a nice email from a gentleman from Slovenia with a request for help - maybe you all might know the answer - the question is - where do you find a decent map of the positions of all the Indian nations at the time of the Seven Years War? 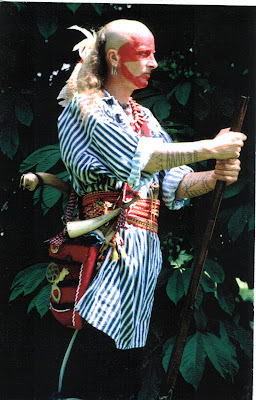 He's got the Osprey one in the Woodland indians one...I can't think of anything else at the moment. Maybe the book Atlas of Great Lakes Indians might have it - I don't have it but I think there was a fairly accurate map of the Ohio Indians there but don't buy it just on my failing memory. Some of the period maps made by the French had some Indian nations on - not sure - anyone know about this subject? 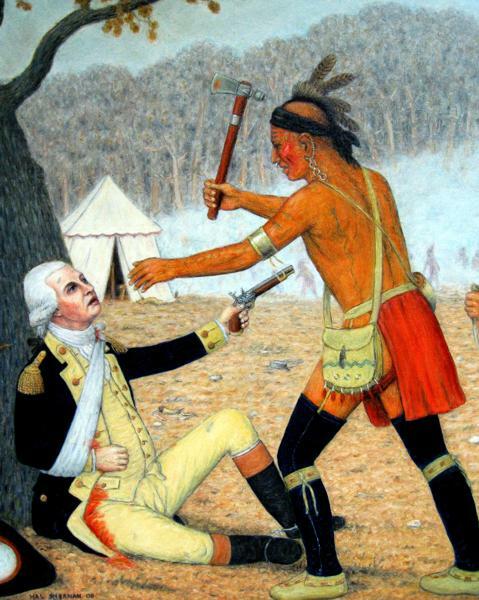 Here where he tells of how he got into frontier history. I haven't seen this book but it looks interesting - any of you read it? 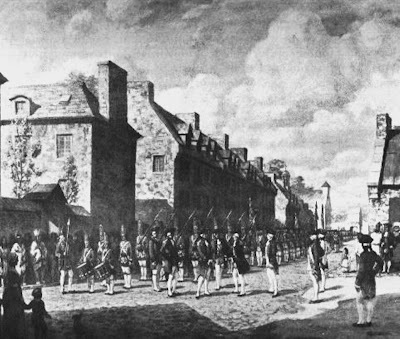 As a young grenadier in His Majesty's 78th Regiment of Foot (Fraser's Highlanders), Sergeant James Thompson took part in the capture of Louisbourg, 1758, the battle of the Plains of Abraham at Quebec, 1759, and the battle of Sillery, 1760. 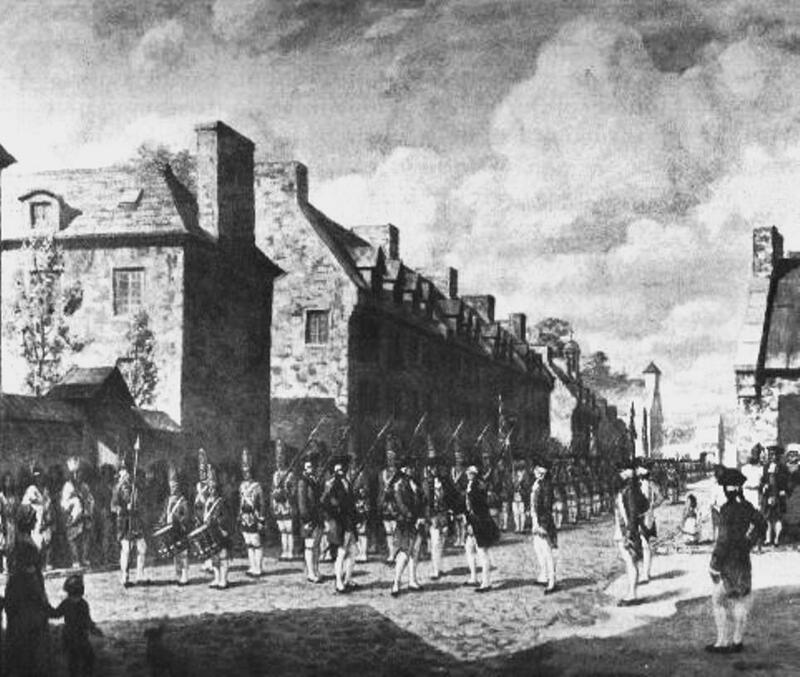 Later he experienced the American blockade of Quebec by Generals Richard Montgomery and Benedict Arnold during the Revolutionary War. Thompson remained in Quebec the rest of his life. 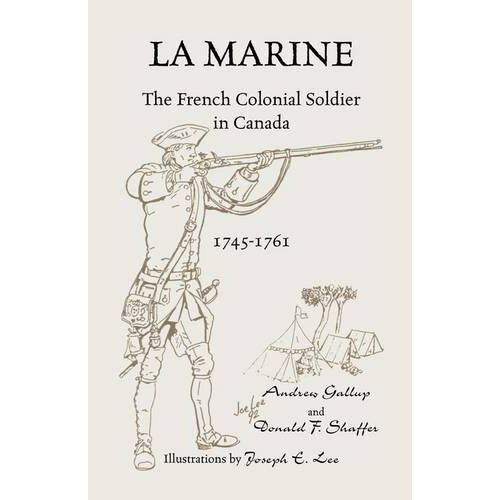 His anecdotes form one of the most interesting personal accounts of soldiering during the Seven Years' War, and his journal offers a first-hand view of life in Quebec in the years that followed. 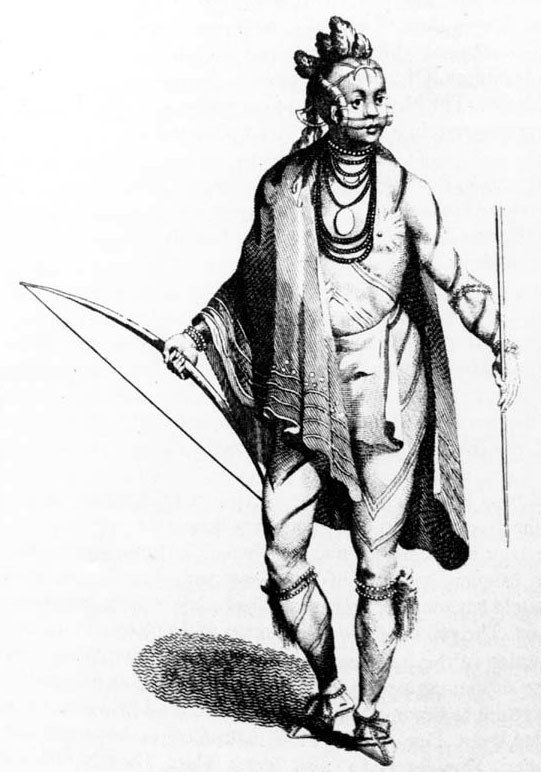 An astute observer with an eye for a humorous story, by the time he reached old age he was sought out by governors general and royalty to recount his stories of earlier times. Editors Earl Chapman and Ian McCulloch not only present Thompson's anecdotes in one volume for the first time, but they also present a wealth of explanation and historical background to bring the period to life and place Thompson's experiences in context. Apologies if you have seen this before. 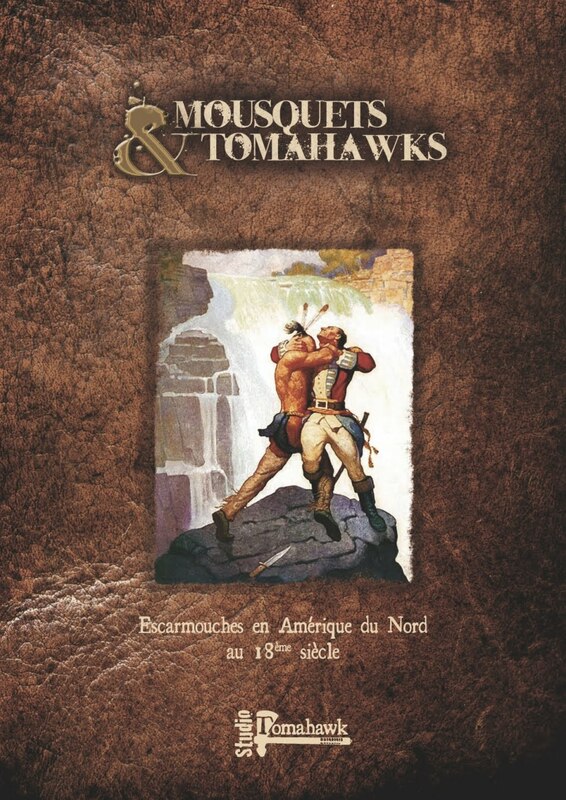 A short reading from the new novel of the French and Indian War that takes place months after the end of the book, THE LAST OF THE MOHICANS by James Fenimore Cooper. 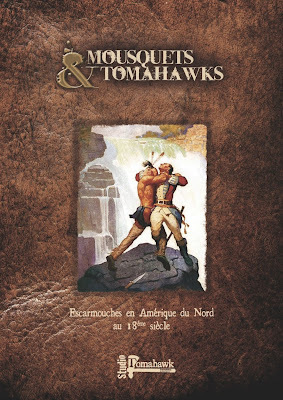 The book traces the exploits of a company of Rogers Rangers from the second battle of Fort Ticonderoga in 1759 to the battle for Quebec between Generals Montcalm and Wolfe on the Plains of Abraham. This is on tv as I write. How I managed to get to be 50 years old and not see this movie is a mystery to me. But if you like Mountain Man movies - this one is set in the 1830s - then check this one out. 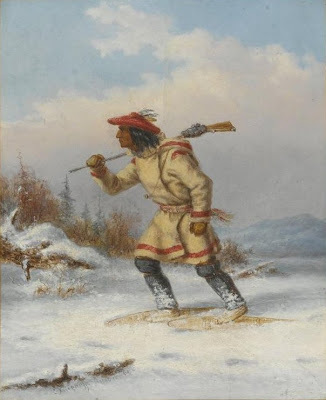 This is a new blog based around a card based skirmish system for battles in North America. English and French language is on the blog. Based around the use of approximately 20 figures a side. There is an English language version of the game in production. 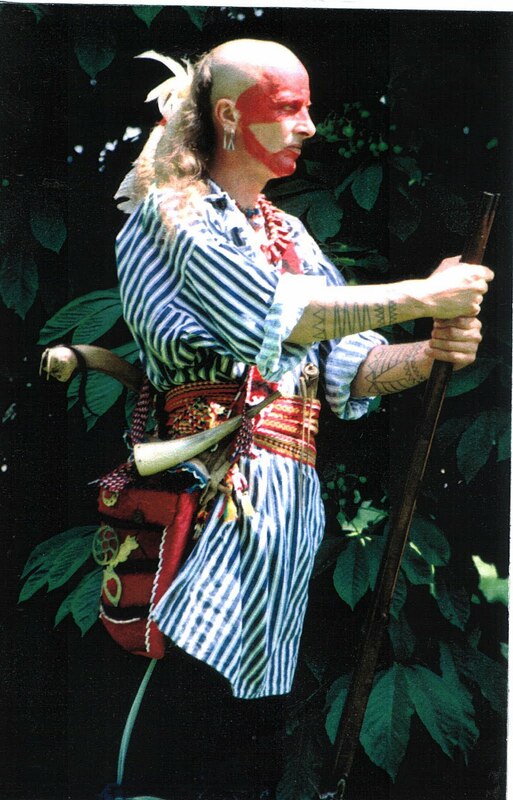 Someone who was a pioneer of interest in the French and Indian war was British military historian CCP Lawson. I imagine he was an influence on Ron Embleton. He did a lot of colour pictures of Rangers and the 60th and so on - I can't find any so if you have any send them to me and I'll put them up. Here is his Regiment de la Reine. 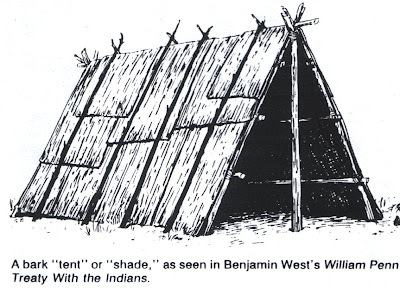 Used by Natives, Rangers and other irregulars. Some more images scanned from old photos from the late 90s. 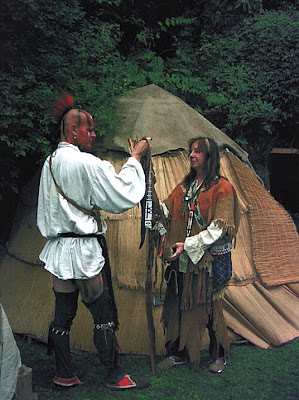 When I started off reenacting the F&I in this country I was lucky enough to recruit people who had already years of experience recreating Indians privately. Once they were reassured that it was going to be done well they soon brought in their friends. Here's a few old photos Sue uncovered today from an old publicity folder. They are Greg (b/w), Chikala (colour) and me with Penny in front of the wigwam and the two head shots Bob and Span. Impressed by these photos. Hope you are enjoying them too. According to what I've read there was some 1,000 troops labelled Compagnies Détachées at Louisbourg at the siege. Anyone have any idea what they were and where they came from? Photos from the recent European theatre SYW event in the Czech Republic. Lots of images to trawl through but if you like the Austrian army - which I do - there's some great photos. 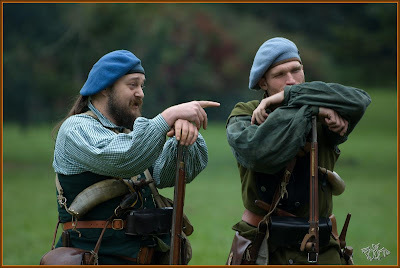 It would be interesting to find out how a lot of these European theatre infantry could be easily converted to F&I - anyway it's always pleasant to look at event photos so enjoy. Thanks to the HICF for sending them in. 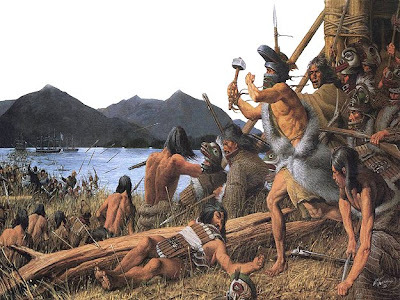 Scott on his blog did a piece on this 1804 battle between Tinglit and Russians in Alaska. I'd totally forgotten about this battle - I think CDV's RTS 'American Conquest' had this theatre included. The video is a nice introduction to the location and battle. Here is more from the Czech republic's F&I scene. Excellent photos again - watch them as a slideshow...all the sections are well done - civilians and both sides...love to do an event with them some day. Cheers!